A crisp, clear day in the Village of Greenport. Located on the northern fork of Long Island, Greenport proves that you don’t have to go very far to get away. Settled in the 1600s by a small band of adventurers, Greenport’s early history includes maritime construction, a lucrative whaling and oyster industry, and the progression of the railroad system - furthering the commercial development of Long Island. With such a rich history it’s easy to imagine the alluring nature of Greenport. The streets of Greenport are always bustling with activity. Having moved on from its days of old, the Village of Greenport is now a hugely popular and successful tourist stop for many Long Islanders and visitors of Long Island. 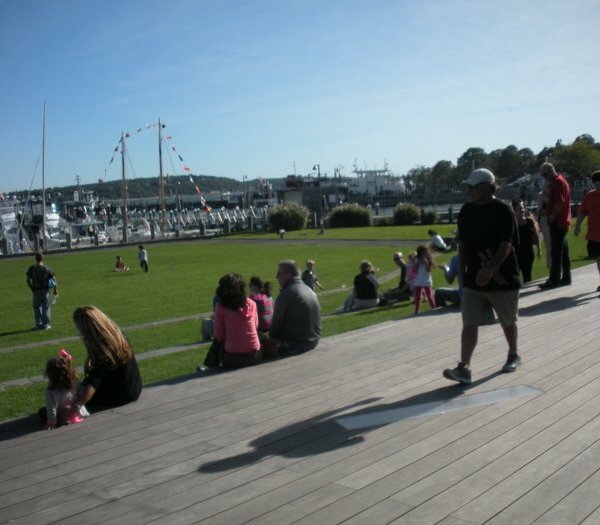 Mitchell Park, located right on the harbor, provides visitors with a beautiful grassy area to relax and people watch. You can walk along the boardwalk or take a ride on the antique carousel right in the middle of the park. After you’ve gotten your fill of the park and the views it’s time to fill up your stomach and stop by one of the many independent restaurants, all right within walking distance. Greenport cuisine is top choice for foodies who prefer the farm-to-table method and enjoy trying out delicious foods, and wines, from local producers. 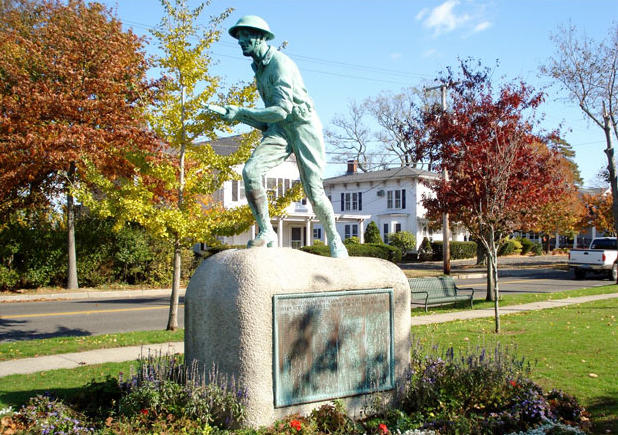 The Greenport war memorial pays homage to the town's role in the Revolutionary War. Greenport possesses the perfect mixture of historical allure, eclectic shops, and delicious food choices ranging from more upscale to very economical, all thrown together in a friendly, little, seaside, walk around town. Voted in 2011 by Forbes as, “One of America’s Prettiest Towns,” it is impossible not to fall in love with Greenport. 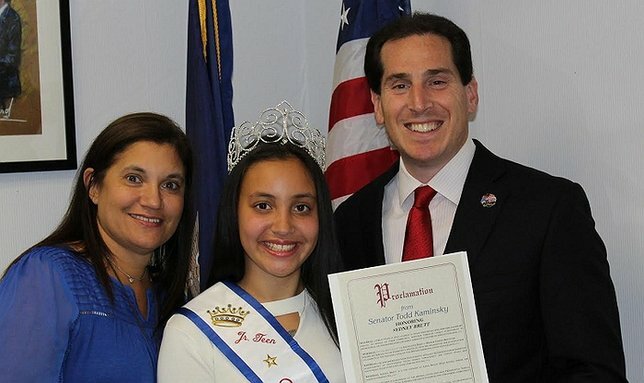 Greenport is a great place to visit and bring the kids along. 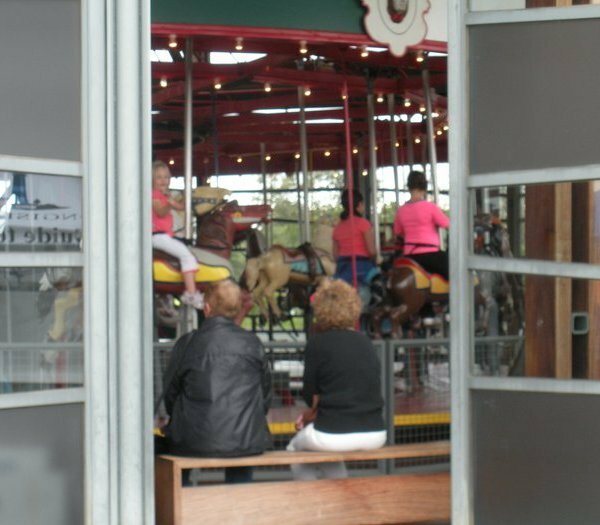 The village has museums, a skate park, an old carousel, and much more to keep the kids thoroughly entertained. They will be having just as much fun as you exploring everything this beautiful village has to offer. The park carousel is a popular attraction amongst children. Located right in Mitchell Park on Front Street, this antique carousel operates daily during the in season and weekends during the off season. If you’re one of the lucky few who can succeed in grabbing a brass ring during your ride then you get awarded a free ride! During the wintertime, weather conditions permitting, Mitchell Park opens its outdoor ice skating rink for visitors and town folk to enjoy. The cost on weekdays is $5 for adults and $3 for those under 18/seniors, open 3-5 p.m. Weekends are $10 for adults and $7 for those under 18/seniors, open 11 a.m. to 5 p.m. Located on Moore’s Lane, this 20,000 square foot, outdoor skate park includes mini-ramps, a street course, and a half-pipe. Pads and a helmet are necessary to use the facilities. No small town would be complete without a cute, quaint, little toy store! Be sure to check out their extensive rubber duck collection, they have almost every kind imaginable. Kids (and adults!) will have a blast getting in touch with their creative side and painting their very own pottery at the studio in Greenport. 7-10 days later your one of a kind piece of art will be all ready for you to pick-up and display at home. From seafood to Italian food, sandwiches to artisan cheeses, Greenport’s delectable food scene has a little bit of something for everyone, not matter their taste preference. Here are just a few of the many restaurants to choose from in Greenport. Bruce’s serves a wide variety of breakfast and lunch foods, and of course cheese and meat plates. They have just under 10 different grilled cheeses for you to try! If you're looking to grab a slice of pizza or enjoy some Italian cuisine you must stop at Emilio's. They have a coal burning pizza oven and a large dining area to accommodate guests. This restaurant has a great atmosphere and one that is reminiscent of a European bistro. If you go with a group you have to split a mussel pot, be warned they are huge! Bière also has an awesome selection of beers. Located at Sterlington Commons, you can eat your scrumptious sandwich in, there’s plenty of seating, or opt for takeout. Perfect if you’re looking for a quick, filling bite, at an economical price. For more great restaurants located in Greenport, check out our Greenport Restaurants Guide! 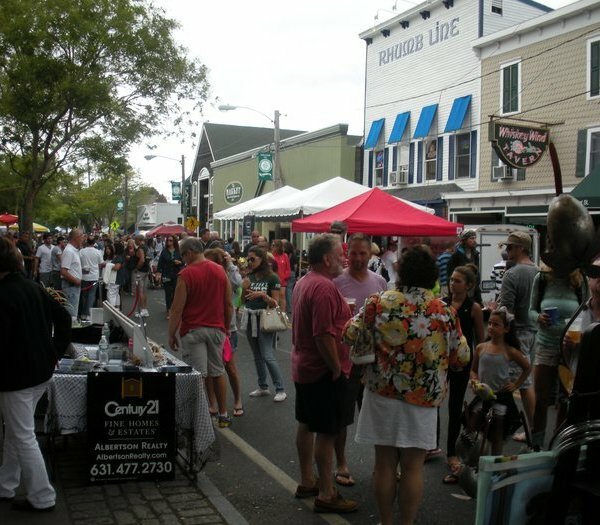 Whether you’re looking to purchase some new, unique pieces for your home or you simply enjoy viewing art from various regions, the Village of Greenport has many different galleries all showcasing superb artistic creations from the East End and around the country. Located on South Street in Greenport in the old Town Hall, South Street Gallery displays first-rate artwork by both established artists and up and coming artists from around the country. Gallery M features contemporary crafts and art from artists in the United States and Canada in various mediums such as wood, ceramics, metal, glass, fiber, jewelry, and fine art. Come out for a visit to view artist Cindy Pease Roe’s painted cigar boxes, sculptures, and other mixed media artwork. Situated in a historic 1907 building, realist painter Isabelle Haran-Leonardi, well-known for her huge oil paintings of Eastern Long Island waterways and vineyards, welcomes visitors to take a look around the gallery and even view the painting process. Just steps away from the historic harbor, the Terrence Joyce Gallery displays artwork depicting life near the Long Island Sound and Peconic Bay. Terrence Joyce’s own work specializes in mythical and spiritual themes. It never hurts to make some time for an educational stop while you take in the sights. With such a rich, historic past Greenport is teeming with educational locations to visit, places to go to peer into the past of the area, and of course, opportunities to learn something that you didn’t know before. The Greenport Railroad Museum of Long Island preserves and restores artifacts of Long Island's railroad history. Originally part of the Long Island Rail Road, the building the museum is in is one of the few original stations left on Long Island constructed prior to the 1900s. Exhibits include lighthouse lenses, like the Fresnel lenses, and information about the maritime heritage of the area and fishing industries. Located in a former LIRR freight house, the museum has exhibits both on the inside and outside of the old building. The museum houses some rare historic treasures, including a pneumatic powered turntable, only one left of three in existence. Visit this old school house on the corner of Front Street and 2nd Street to take a peek into the past to see what schools looked like centuries ago. Make your way to Carpenter Street to view the old pictures, memorabilia, antiques, and historic artifacts from the Greenport Police Department. Located in Mitchell Park, visitors get the chance to see what a blacksmith shop looked like and observe an actual blacksmith at work. You can’t have a seaside village without plenty of water activities! From lighthouse cruises to fishing charter boat excursions, Greenport has it all. Spend your day out on the open waters of Long Island in the company of your friends and family, enjoying the onslaught of information from your knowledgeable guide. A view of Greenport harbor on a beautiful day. The museum offers lighthouse cruises which allow you to learn some nautical history, get up close and personal with the lighthouses, and for those seekers of the paranormal out there, they even offer haunted lighthouse tours. Departing from Third Street in Greenport, the Peconic Star Fleet offers fishing excursions with state of the art electronics and equipment, lighthouse cruises, and fireworks cruises. Whether you want a yacht or a boat, have a large or small party, you can sail the open waters in style during a 2 hour, half day, or full day charter trip. All the fun isn’t just for the kids! Adults are guaranteed to have a fabulous time while spending the day in Greenport. Take a stroll through the village, shop around in the boutiques and eclectic shops that line the streets, pop in the brewery for a cold one, and don’t forget to take in the historical sites. Mitchell Park is always teeming with fun activities. When you're there, check out the Camera Obscura for a panoramic view of the park. Hawkins Avenue, 2 blocks South of the Long Island Expressway Exit 60. This summer, eastbound customers of the LIRR are provided a unique commuting experience. Every Friday, beginning Memorial Day weekend and ending the Friday before Columbus Day, the 5:21 PM train departing from Ronkonkoma for Greenport, will be serving wine. Customers can select from a variety of beverages produced by local wineries. Snacks and soft drinks can also be purchased for reasonable prices. Sit back and relax while the LIRR takes you where you want to go. A great stop for any beer connoisseur or just anyone looking to enjoy a tall, cool, glass of craft beer. The brewery offers pale, black, and golden ales, and beers with all different levels of hop to them. If you’re unsure of what to try head on over to their tasting room! Guests can enter the huge camera obscura in Mitchell Park, one of only five left open to the public in the United States, control the lens, and get a 360 degree panoramic view of what is happening outside. A must visit for camera buffs and photography lovers. Held in the Greenport United Methodist Church lot, vendors offer a diverse selection of foods like, fruit, vegetables, seafood, cheese, wine, baked goods, sauces, and dressings. The market is held on Saturdays from 9 a.m. to 1 p.m. May 24th thru October 11th. If you decide to extend your visit from a day trip to an overnight trip don’t fret, there are plenty of great accommodation options in Greenport, equipped with a friendly staff, ready to see to your stay needs. From waterside resorts with harbor views to inns overlooking Mitchell Park, perfect for sitting out on the patio with a morning cup of coffee and people watching, you won’t be disappointed with your lodging or the surrounding area. Located on a cliff overlooking the Long Island Sound be prepared for some breathtaking views. Rent a condo with access to a lovely beach where you can sit in the sand and watch the sunset over the water. Great location, within walking distance to everything, with beautiful harbor views. Well kept facility with nice size rooms and a staff willing to answer any questions you may have about what to do in town. This small, sweet, waterfront motel with a wonderful area with picnic tables is a great place to spend the night. Very clean and close to the beach. No pets allowed. This motel has a rustic look with retro charm. The staff is very friendly and helpful. Great value and only requires a short drive to get to the middle of town. If you are considering taking a trip to Greenport there are a few different transportation options to get you there. One way is to take the LIRR to the Greenport stop at Wiggins and 4th Streets at Ferry Dock. You can choose to go by car and take the Long Island Expressway to the last exit, drive down Old Country Road until it becomes 25 East - approximately 30 miles to go after getting off the LIE exit. Another option is to take the ferry that stops at Orient Point and drive or call a taxi from there, it is only about 8 miles from the Cross Sound Ferry to Greenport Village. If you're looking for fun things to do in other great places on Long Island, check out our other Guides for Sag Harbor, The Hamptons, Northport, Freeport, Montauk, Ocean Beach, Fire Island, Port Jefferson and North Fork!